The Road to Better Health Begins Here! It aims to uncover why your body is not functioning properly. No two people have the same genetic makeup, history or life experiences. We are all unique and different. As a result, we need a health plan that addresses these differences. That’s where functional medicine comes in for it’s truly Personalized Health. For 10 years, I suffered from Rheumatoid Arthritis, with very little success from prescription drugs. After 4 months under Dr. Serle’s Autoimmune program, I have very little symptoms and no side affects. Thank you Dr. Serle for educating me. I now understand what inflammation is and how I can control it …you’re a true healer! 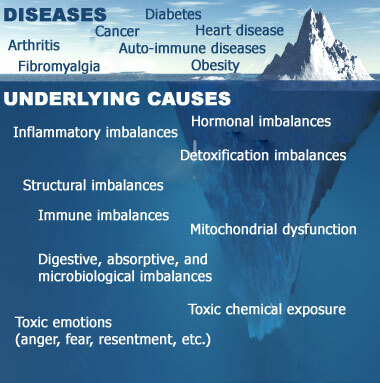 Functional Medicine seeks to identify and address the root causes of disease. Stresses of all kinds begin to take their toll on the body and eventually dysfunction results. If the stresses continue, this dysfunction leads to symptoms. If we don’t heed the warning that the symptoms represent, we might allow a dysfunction to develop into a full-blown disease. There are over 80,000 synthetic chemicals in our environment. Many are used in everday items including foods, prescription drugs, beverages, hair and skin products. Now we can truly treat and cure disease with Functional Medicine, it is the future of conventional medicine. It views the body as one integrated system, not a collection of independent organs divided up by medical specialties. The information outlined here is not intended as a substitute for personalized medical advice The information written here should not be construed as a claim or representation that any procedure or product mentioned constitutes a specific cure, palliative or ameliorative. Procedures and products described should be considered as adjunctive to other accepted procedures, deemed necessary by the attending, licensed doctor (Dr. Serle). It is the concern of the Department of Health and Human Services that no homeopathic and/or nutritional supplements be used to replace established, conventional medical approached especially in cases of emergencies, serious or life-threatening diseases or conditions. Dr. Serle shares in this concern, as replacing conventional treatment with such remedies, especially in serious cases, may deprive the patient of necessary treatment and thereby cause harm and could pose a major legal liability for the health professional involved. Do not use formulas as replacements for conventional medical treatment.